Remember the days you phoned up a friend and asked them to come over? You would then have to phone them back, hoping to catch them to tell them to bring something with them, maybe a game or a video game controller so you could play TV games together. These days you message a friend and you meet online where you can socialize and play at your convenience. The biggest draw for online gaming is the fact that you have constant access. The gaming sites are accessible 24 hours a day, 365 days a year and there are always people online to play against or with. Games have become such a sociable event online, which is a huge draw card for the majority of players. But it’s the accessibility and convenience of the gaming structure with its high definition graphics and sound that is so appealing. Don’t get me wrong players still use Xbox and PlayStation games as well, but these have even moved to the virtual realm of things. You can now buy gaming console games which require internet access enabling you to play with or against your friends. The cloud has made this even easier for many online gaming sites; the speeds have been improved, ensuring easy access for all the players who are gaming online. There has been a lot of controversy over whether online gaming is a healthy option. Remember we used to play in the park or ride our bicycles down the street, these days children play games on the internet, glued to their computers. But in reality it is a very sociable gaming experience. Friends can meet up and chat, you meet people from all over the world making new friends and you get to play against your friends as though they were sitting right next to you. With internet speeds what they are today, the streaming is seamless, this enables all players to play and chat at the same time with real time voice, so you can just chat away into your headset as you play and your friend on the other side can hear you and comment. It’s great fun. Most of the online games today have an area where you can go and practice before you join the virtual world. This is where players can gain their confidence by improving their gaming skills. It’s an opportunity to play without actually being competitive in anyway, once you are comfortable you can join the live games and play to your heart’s content. Skills are improved through the information provided by these gaming sites, they often have instructions on how to play the games and rules, so you can follow the step by step instructions until you are comfortable enough to face the game on your own. There are so many online games available from shooting games and war games to online casino games such as poker, bingo and slot machines. With such a wide selection to choose from with the click of a mouse, it’s no surprise more people are turning to online gaming. Before online gaming you had to go to a casino to play a game or you had to go to a gaming store and search for the games you wanted, probably pay way too much money and then go home to play. With online gaming you can play anytime you have the internet, so you don’t even have to be at home. You can have your laptop at your favourite coffee shop and have a game or two before heading off, it is so convenient. The great thing about online gaming is there are games for everyone. Not everyone enjoys casino games and at the same time not everyone enjoys shooting games. Time management games, problem solving games and hidden treasure games are also on the top of the list when it comes to playing online games. The one thing that has always struck me is how expensive it is to buy a game at the store. A new release game can cost you a fair chunk of change, but when you get home and find it online you can play online or download it for a fraction of the price. Combine price with variety and gamers can enjoy so many more games for the same price they would pay for one game in the shops. That is reason enough for me to enjoy online gaming and it’s easy to see why it’s become so popular in the past couple of years. You can take your online gaming experience to a new level and learn how to play poker for free or you can give a hand at cash tables and see how your online gaming experience soars to new heights. To some employees the words ‘team-building activities’ can bring on a sense of dread. When organised properly, with the good of the employees as a central focus, these days can be a great way to build a good team at work and get to know your peers in a different context. Here I will suggest a few ideas that can make your team building day a beneficial one, not just one of the dozens they’ve attended before. To keep your group engaged you need activities that really require thinking and active discussions between team members. Ideally, for half a day, you’d have 2 ice-breakers, one team-building, and one problem solving activity. So here are the four best activities to provide you with an ideal agenda for a team building session. This is a great ice-breaking exercise for groups who aren’t familiar with each other – so ideal for conferences. Simply get each team member to write down two truths and a lie about themselves, and then share the 3 statements with each other. The aim of the game is to work out which statement is false, whilst learning a bit about everyone in the group – but only reveal the false statement once everyone has taken a guess! This is a great game to break the ice both in situations where participants know each other well, and where they don’t know each other at all. Break the team down into small groups, and give them 10 minutes to find out all they can about each other. Then ask every group to come up with three “categories” that describe each person within the team – without being negative, discriminatory or prejudicial – for example, someone could be a “sci-fi fan”, a “toffee popcorn lover”, and a “Twitter addict”. This shows how every person has more to them than meets the eye, and gets everyone to open up. This exercise gets down to the nitty gritty of team-building – it gets people to voice their opinions, argue their points and come to compromises. Split your group up into teams of 4-10. Give the teams the scenario that they are about to be shipwrecked on a desert island, and can chose 10 items to take with them. Give them a time limit of 15 minutes, and let them debate! This activity takes a little setting up, but is ideal for really getting people to work together to problem solve. You will need a bucket filled with water or tennis balls (I would recommend only using water outside), a larger bucket, 8 x 2.5m lengths of cord, 1 x 4m length of rope and a bungee cord loop. Place the bucket in the middle of the room, and map out a circle around it with the rope, and place the larger bucket about 3m away from the circle. The bucket with balls/water represents a container of “toxic waste” and the circle around it represents the “contamination zone”. The aim of the game is for the team to move the toxic waste into the larger “toxic waste neutralising” bucket within 30 minutes – but only using the 8 cords and the bungee loop. If they enter the contamination zone they will suffer severe injury, and if they spill the contents of the bucket, or do not complete the task, the world will be destroyed! These exercises are actually a really great way to get to know your team, build trust between you and establish a working bond. When organising one of these events, plan ahead. Planning a team building session isn’t easy – you’ll need to make sure you’ve sorted your meeting room hire, and you’ll need around four main activities, and no one wants to be the person who suggests, for the hundredth time, to do the Trust Lean! Any team building fails you would like to share? James Duval is blogging genius with a flair for IT, business and education. He blogs for Keele Conference. Let’s face it: everyone gets bored in the office once in a while (perhaps a little more often than this if we’re honest with ourselves). But what can we do about it? Well once the lunch break begins we can finally spend some time unwinding, thus allowing our brains to lapse into more relaxing thought processes. However, aside from eating, you want to do something interesting with that hour of free time, right? Games are a great thing to occupy your lunch hour with. Allowing for you to eat, play and socialise, they’re an excellent way to pass the time (assuming you haven’t got anything better to do, of course). So what options do you have? If your office is lucky enough to have a games console (or two) then video games are a definite option. 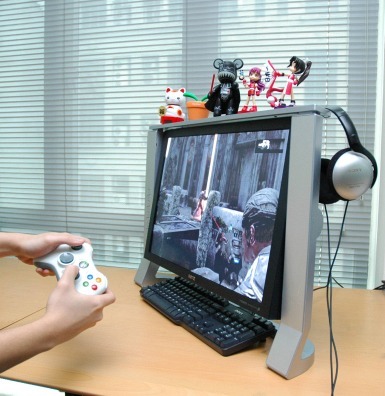 Which exact games you can play are generally limited by the console (although there are plenty of great games that feature on multiple platforms); an office Wii will allow for a lot of informal, party-type games whereas a PS3 or Xbox 360 opens up the opportunity for a few FPS matches or maybe an inter-departmental fighting game fest. Board games are great for sitting around and chatting over during a lunch break. While certain games that can run for hours are probably not the best idea (Monopoly, I’m looking at you), a quick game of Scrabble or some quickfire Cluedo can be a great way to spend your lunch hour. Additionally, if you’re feeling particularly adventurous then you could possibly run a tabletop roleplaying game one shot. While a full game of something like Dungeons & Dragons isn’t likely to be feasible, you can play games such as Werewolf (sometimes known as Mafia) or Munchkin if your co-workers are up for it. Cards could also tentatively be counted as falling into this subcategory, but it’s probably best not to start up a tense, high stakes poker game on a Tuesday afternoon at the offices to rent. If you’re lucky enough to have a pool table at work then you know exactly what to do come lunchtime: play a game. Often accompanied by a dart board if you’re really fortunate, it can be great to have a bit of pub atmosphere at work (you might even be able to treat yourself to a cheeky beer if it’s Friday), with games tending to last exactly the right amount of time (unless it escalates into some kind of epic honour battle, of course). Jonathan Marks definitely recommends video games consoles in the office. Just sayin’. I have always been a California boy. I was born here, went to school here, worked here, and will most likely die here unless I am traveling at the time. For some reason the women I have attracted have never been from California. My first two wives were from Michigan and my current (and last) was raised in Oregon/Washington. My sensibilities tend to gravitate towards football games, hot buttered rum drinks, and over-eating when the rains come. This is obviously not too healthy, but the “rainy days” are few and far enough between that the lifestyle never gets too sedentary. Of course ski trips and other “outward bound” trips break up the winter. My skiing career started when I was 5, walking up the hills and skiing down. The thing I never really embraced was the all day, grey day in March when there is no Football, Baseball is just in training, and BasetBall and Hockey are not my favorites. We had kidz. We had great kidz; they were into everything. They attended Adalante Spanish immersion school, the both got their kiddy black belts in Okinawa Karate, they played some music, held interests in teaching and journalism, partied like their parents, loved and helped people like their pastors, and were generally just great kidz. This happens to be a very rainy day. It somehow reminded me of some of the most wonderful things that my Michigan wife and I did with our Kidz. There was an area down from where we lived in the hills, down by Middlefield “Little Mexico” where the fields were not as well grated, and there were big depressions in the turf, where huge lakes (at least 8”deep) would accumulate during a good rainfall. 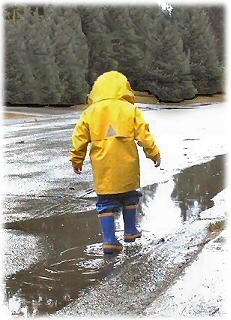 Kip (Mom) would dress the girls all up in their finest Muck-luk attire (boots, hoods, slickers, goggles, astro-hand-warmers, etc…) and we would head for the puddles. It didn’t matter if it was raining 1” an hour at the time. It also didn’t really matter how cold it was outside, but being California, it was usually still mid ‘60’s when we were out. The real game plan was to totally drench everybody around you. It didn’t matter that it was cold and wet, the action of the competition and play was such that nobody was ever cold. 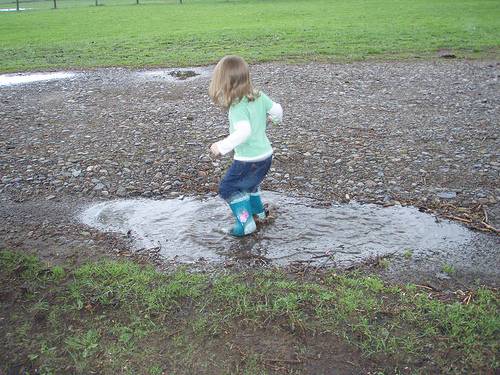 There would be the unsuspecting girl (or Black Lab) standing way too close to a 6” puddle, and it was irresistible to jump in with both feet and splash the heck our of everything.. As the exhaustion became an aphrodisiac and the endorphins mixed with the lack of sensitivity to the cold, we became a bit bolder. What were at first “foot- stomps” denigrated into full body slams into the cold rainwater. When the splashes were insufficient, there was indeed (hate to say it as a dad) dunking involved. There were side splashes, back splashes, back lashes and amazing crashes. There were times we brought our bikes, walked with spikes, floated tikes, it was all good. The inevitable end to the day was to throw all the clothes (down to the undies) into a huge garbage bag, pile into the Astro Van (the best family vehicle we were ever exposed to until my wife decided we needed a leather lined Tahoe that got half the mileage and cost twice as much) and as hypothermia was beginning to take control, rolled back into the driveway of our Upland home. An hour later, dressed in their “onesies” or whatever attire was appropriate for their age, we were all snuggled in front of the fireplace. We were always resplendent with the memories of the day, the wonderful feeling of having an athletic “outdoor” day, enjoying the contrasts in temperature, the sheer excitement of the splashing and wallowing, and sharing the “Aprè” experience with our family. 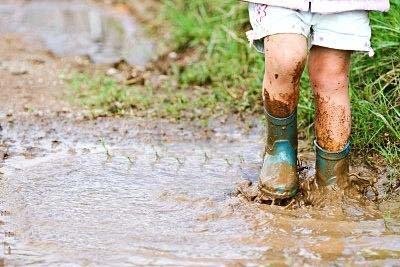 Every time I see a puddle on the side of the road, I have to drive through it or stomp on it.